I’ve had the good fortune of reviewing gear from a few ‘by women, for women’ companies in the recent past, and I’m very excited to highlight another—Kari Traa. Kari, the person, is a Norwegian, three-time-Olympic-medaling freestyle skier who turned knitting beanies and customizing her own ski gear into a full-on outdoor active wear company. Kari Traa, the company, features technical colorful designs in base layers, training gear, outerwear, and accessories. I have several friends who swear by the Kari Traa base layers for ski mountaineering, trail running, and other mountain activities. It has been fun giving two of their lighter-weight training pieces a hearty test as Colorado has been celebrating fall-like temperatures for a few extra months now. 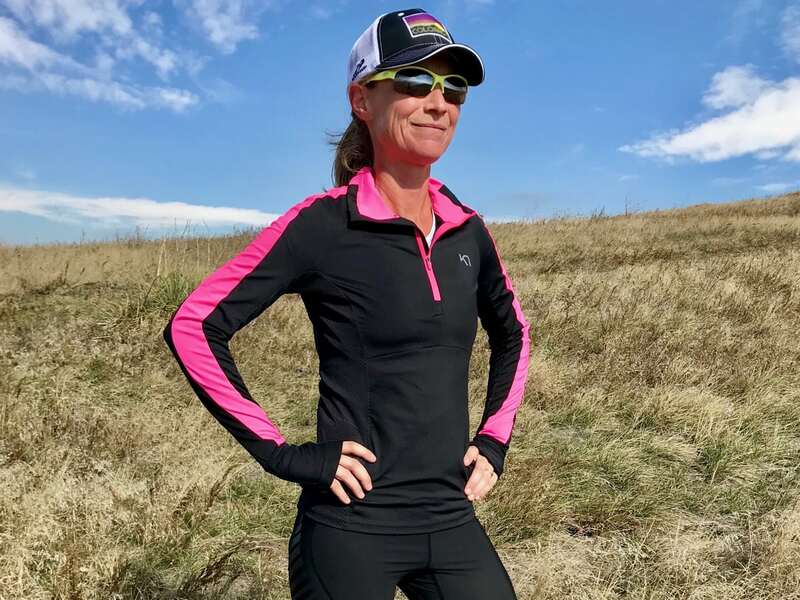 The Kari Traa Kristin Long-Sleeved Quarter-Zip Top ($74.95) is a thin, slim-fitting, wonderfully stretchy, lightweight polyester top that functions similarly to a poly-pro one layer with enhanced breathability. 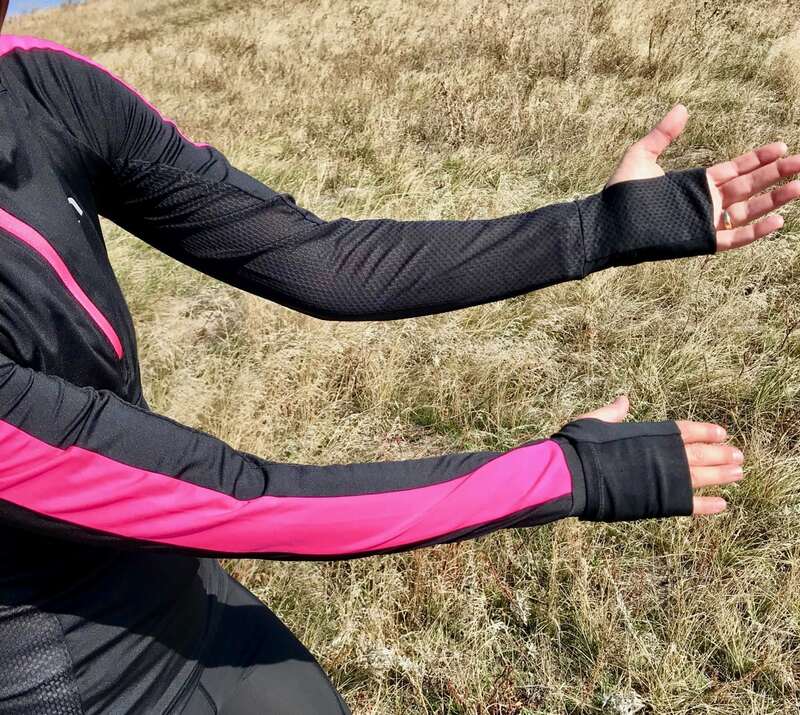 It’s perfect layered over another light short-sleeved base layer when you just need to take the chill off of an early summer run, or it slips beneath a burlier mid- or outer layer on colder days in the winter. It has a very smooth almost slick feel, so it’s nearly unnoticeable against other clothing or under a pack. The breathability of this piece is amazing for those who run on the warm side—I’d even call it ‘breezy.’ A center panel perforated with small holes runs down the length of the middle of the back, which eliminates any moisture build-up against your skin when running with a pack. On the medial aspects, on both arms from armpit to wrist and on the torso extending down the sides to the bottom of the piece is a very soft, stretchy panel with large mesh holes, which lets any heat escape quickly that might build up through the torso. Kari Traa Kristin Long-Sleeved Quarter-Zip Top back view. The mapped construction utilized in this design yields a top that is as at home on the climbing wall as it is on a long run or post-run yoga mat. It’s a very versatile piece especially for those who need breathability over warmth. I appreciate the attention to detail with the very soft zipper gutter that protects my chin from the top of the zipper and extends the length of the zipper for a bit more warmth. The long thumb holes and fold-over mitts on the long sleeves are also perfectly comfortable and useful when full gloves aren’t necessary. I find it to be the perfect layer for me in the 40s and 50s Fahrenheit over another thin tech top. If it’s windy or colder, I prefer adding anything from a light wind vest to a winter fleece or jacket. Kari Traa Kristin Long-Sleeved Quarter-Zip Top arms and mitts. The lightweight Kari Traa Louise Tights ($84.95) also feature mapped construction for freedom of movement—which I’m becoming a big fan of—and utilize a slightly denser polyester material with a finely ribbed interior for the bulk of the pant, highly breathable mesh panels behind the knees, and thinner, lightly compressive panels at the lower leg. The wide waistband is very comfortable and hits between one and two inches below my true waist. It also features a continuous drawstring for fit adjustments should you need it. The ankles feature side zips with a soft protective layer against the skin and a silicone pattern at the ankle to prevent drift. Large reflective triangles highlight anterior and posterior aspects of the knees on both sides. Beneath the waistband on the back is a horizontal zip pocket capable of holding a couple gels and a car key without creating any chafing points against the skin. Kari Traa Louise Tights front view. One thing that stands out with these tights is the absolute ease of moving around in them. They are very form fitting and relatively slick on the outside, so at first I wondered if they might somehow be restrictive with high step ups in the mountains or rocky runs requiring a lot of agility… or, let’s be honest, a post-run meal at my favorite French bakery. However, it only took one run and an impromptu yoga session afterward to convince me otherwise. For as small as they looked coming out of the shipping bag, they are very accommodating and comfortable with any type of activity… including pastry eating. There’s no need for tugging, squatting, or otherwise finagling to get the tights in place once they’re on—no sagging or seam chafing after several hours of wear either. The smooth face of the material also makes them perfect for slipping on under another layer—rain pants, ski pants, and a fleece dress were all things I tested out with comfortable success. I love this about outdoor adventure gear made by women and for women—they truly are designed from a woman’s experience and perspective. The other thing that ‘stands out’ about the Louise Tights is their look in general. My entire collection of running tights and pants is black. My comfort zone, for better or for worse, is definitely a more subtle look. These, even in their muted darker teal color, are definitely not black. Add in the hot-pink highlights, the giant logo down the right side of my thigh, and the contrasting seams, and they almost make me feel like I should try to ‘match’ the rest of my gear. Color-coordinated Kristin—a sight to behold! Their performance and comfort make it all worth it however, and I’m definitely interested in trying another style of tights in a warmer base-layer option. Kari Traa Louise Tights back view. I’m very impressed with these two pieces in the Kari Traa ‘Training’ line. I can see why my mountain friends have been raving about their layers, and I’d certainly be interested in trying warmer pieces for when winter finally hits. 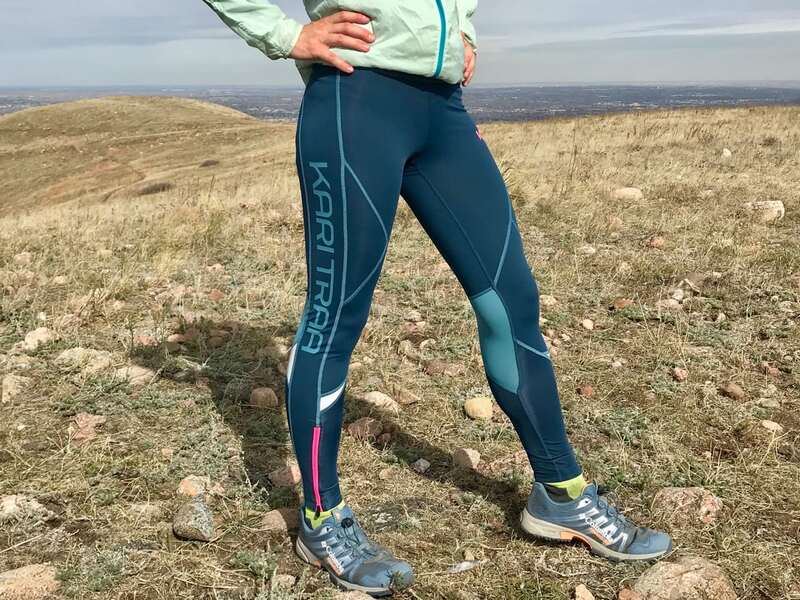 The Kristin Long-Sleeved Quarter-Zip Top and the Louise Tights are excellent choices when light warmth, breathability, and ease of movement are key for your next trail and post-trail adventure. *Note on sizing: I am, as always, between sizes looking at the specific measurements of these two pieces. I typically go up a size because I value comfort over all else, but I contacted their Facebook page for sizing advice just to make sure. They responded promptly and suggested I try the smaller of the two sizes because of the nature of the stretch and fit of their garments. I’m completely happy with the fit, technical performance, and comfort of both pieces in the smaller size. Hopefully this helps if you find yourself in the same position. Have you tried any of Kari Traa’s apparel yet? If so, which items and can you share your thoughts on them?